Don’t wait for the first hot day to call for your a/c tune-up! You’ll be fighting for an appointment with everyone else who has waited until the last minute. Once your tune-up is done, you should be set for a cool, comfortable and trouble-free summer. In addition to preventing breakdowns, regular seasonal tune-ups extend the life of your equipment and keep it operating at peak efficiency — helping you keep energy costs down. Ask about our Annual Service Agreements. If you have a heat pump, now is an especially smart time to get your tune-up done. 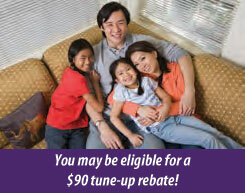 Dominion Virginia Power is currently offering a $90 rebate on heat pump tune-ups. Contact us for more information and to set up an appointment — and save money!